It’s time to buy your partner a present that expresses your love. Maybe it’s your anniversary or their birthday, or maybe you just feel like doing something nice. What’s the best way to show him or her that you will love them forever and always? From deciding to go steady at the sock hop to swiping right on Tinder, the way we choose our mates has varied over the years and so has the way we express affection and commitment to each other. Though marriage largely began as a way for the ruling classes to solidify alliances and amass property and wealth, it has since evolved to represent a partnership of love, fidelity, and friendship. The way you express your affection should be a symbol of all of that: a ring with the birthstone of your children, a symbol of the band you listened to on your first date, or a way of celebrating the book or movie that brought you together. With divorce at an all-time high and millennials choosing to stay unmarried well into their thirties, marriage and commitment have become a bit of a rarity, and you might be at a loss for good examples of how to express what your partner means to you, but don’t worry, you’ve got history on your side. 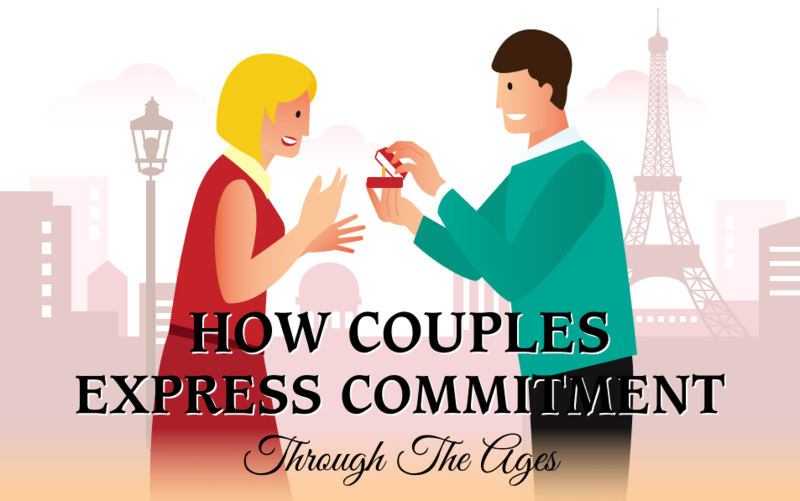 Though outdated courtship practices and arranged marriages also involved an exchange of gifts and tokens of romance, the more our relationships have become predicated on mutual interest, trust, and desire, the more unique the means of expressing commitment has become. Since marriage’s earliest iterations, there has always been an exchange of goods as a means of expressing commitment–women would come to their new husbands with their dowry, an assortment of items that could range from gems to clothing to furniture. Beginning in 1215, Pope Innocent III decreed that couples must wait a certain number of months between betrothal and marriage, so betrothed couples exchanged gifts that could be worn as symbols of their intention to marry someone. In the Middle Ages, as people began to consider marriage more than an economic arrangement, the first more personal, heartfelt expressions of commitment rose to prominence. Think of brave knights wearing a lock of their lady’s hair as he prepares to face his foe or a damsel-in-distress accepting the spoils of her rescuers’ adventures. From Shakespeare’s sonnets to the notion of having “a song,” lovers have used poetry as a means of expressing their love for each other in everything from love notes to Skype sessions. From the very first engagement rings to Breakfast at Tiffany’s, jewelry has endured through the centuries as a primary means of expressing commitment and romantic love. But it’s not the only way! Do you both love superheroes? Design a personalized comic with drawings of yourself. Maybe you both have the travel bug? Plan a romantic getaway for two to someplace you’ve always wanted to visit or maybe a place that has become special to you over the years. Are you both Harry Potter nerds? Dress like your favorite character and give your partner a magical night with Butterbeer and a scavenger hunt they’ll never forget. Nowadays, couples can express their commitment in any manner of ways–whether it’s one handed down through the ages or something entirely original and unique.